Thread: Ramon Molvizar: Has anyone tried this line? Some very interesting looking frags here. I'm quite intrigued by the prismatic "Precious", and also find it interesting that the men get the moon based frag, Luna, while the sun based Sol is for women. Anyhow, here's their page. Would love to hear more about them. I could only find them for sale at 99Perfume.com and they all seem pretty expensive - $175 and up or so. Re: Ramon Molvizar: Has anyone tried this line? Interesting that you brought this up since for a week I've been meaning to look up the web site for the Goldskin notes. I had received a couple of samples from Vijay when he was on BN (miss him). Gift for men was a very light, modern, aquatic. Goldskin for women is a very feminine, vanilla and musk heavy floral. I don't know if the listed notes match what I smell there (sill have a few drops left). Longevity and sillage are incredible. Good quality for sure. Vijay said that when sprayed, the gold particles actually came out and glittered in your hair or on the skin. He used it himself. Black Cube sounds like it could be very good too. From what i've heard, the bottle design is way richer and better that the juice they hold. 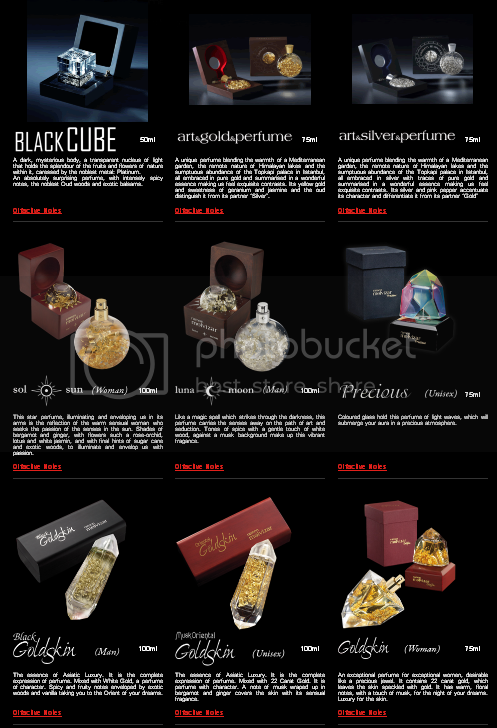 Incredible perfumes, really "Art becomes perfume". Hight quality row materials, unique scents. I have Sol Sun,5 elements and Preciouse. They are amazing, it can be understood by only experts of niche perfumery. ofcource-the price is It is worthy.. They are amazing, it can be understood by only experts of niche perfumery. of cource-the price is It is worthy..
Last edited by furrypine; 16th May 2015 at 12:37 PM. Must to say, incredible work.. hend made one by one. Like crystals. it´s really art ! It is not true, the perfume itself is very very reach..